The sad spectacle of the Ferguson grand jury's long, execrable march towards the inevitable no true bill vote is over. Details of the Michael Brown shooting aside, it has long been clear that whatever the outcome had been, there would be anger, bitterness, and little in the way of dialogue or introspection. This is the sad state of race relations in this country; the inability of too many white people to acknowledge that race still matters greatly, far more greatly than these folks imagine, the refusal to engage in real discussions about this uncomfortable subject, and the resulting sense that justice was not served in Ferguson and that it may have been unrealistic to think it could it have been. On a more concrete level, the end result was exactly what the prosecution intended. That Ferguson's chief prosecutor Robert McCulloch's office did not affirmatively ask the grand jury to indict at the close of the presentation says all one needs to know. In sum, prosecutors can virtually always indict anyone they choose, and here, they chose not to, and did so in a way that enables the powers that be in Ferguson to both shift responsibility to the anonymous grand jury, while offering up "objective" arguments as to Wilson's lack of criminal responsibility. Whether Wilson could have been successfully prosecuted or why McCulloch brought about the no true bill vote are open questions. That the grand jury's vote was the result of a calculated effort by the prosecution to avoid an indictment is beyond argument. Let's start with the basics, the notion advanced by McCulloch that this grand jury objectively analyzed all of the evidence, and dispassionately concluded that there was simply not enough evidence to justify charging Darren Wilson with a crime, is fundamentally false. In theory, that's how grand juries work. They are independent investigative bodies that follow the evidence, subpoena witnesses, and exhaustively pour through testimony, data, and documents, until they can conclude whether there's a basis to initiate a prosecution. It's this independence and dedication to truth seeking, the theory goes, that gives the process its persuasive weight. In his speech tonight, McCulloch offers the argument that this is what happened here, and that we, the general public, need to respect the work of the grand jury, which has reached a reasonable conclusion based on its own fair and honest work. In actuality, grand juries don't function this way. They are guided by prosecutors, who shape the evidence that is presented, and instruct the jury on the law as it proceeds, in order to reach the conclusion that the prosecution intended all along. 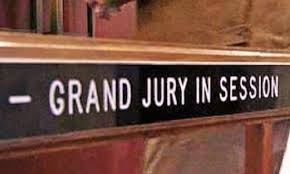 By any account, grand juries almost always indict. When they don't, it means something went very wrong or the prosecution never intended to get the indictment in the first place. As Sol Wachtler, the former Chief Justice of New York State's highest court, has famously said, prosecutors hold so much sway over the grand jury, they could cause them to "indict a ham sandwich," if they wanted. So when grand juries don't indict, it's fair to speculate as to why. When the prosecutor winds up the presentation without affirmatively asking the grand jury to return an indictment and then defends the failure to indict as a proper reflection of the evidence, there's nothing left to speculate about. Parenthetically, when this grand jury returned it's no true bill vote, it may have been honestly come by. It may have been a truthful reflection of the jurors' views of the evidence that was presented as viewed through the legal prism suggested by the prosecutors. I don't mean to imply that the fix was in and the grand jurors knowing players. But, as I listened to McCulloch speak, it was readily clear that the grand jury's finding was very much attuned to his view of the evidence. As he described why those witnesses who claimed to have seen Wilson gun down Michael Brown in cold blood were simply not credible, he wasn't explaining the grand jury's take so much as presenting his own closing argument. Piece by piece McCulloch attacked that evidence that suggested criminal culpability, while repeatedly suggesting that those who wanted an indictment were agitators, provocateurs who were either woefully ignorant or calculating rabble rousers. What McCulloch's speech hammered home was the certainty that the grand jury had reached precisely the finding that the prosecutors had wanted, and that McCulloch's office presented the case in a manner designed to elicit precisely this outcome. That McCulloch did not want Wilson indicted -- be it for political reasons, or a general pro-law enforcement bent, or, as some would say, because he views such events racially -- was obvious. It is impossible to imagine McCulloch delivering a comparable speech if the grand jury had issued an indictment. It is thus reasonable and fair to conclude that it is more than happenstance that the grand jury reached conclusions that parallel those of the chief prosecutor. There were too many witnesses and too much evidence to attempt any sort of simple synthesis. It is not surprising that many witnesses were in conflict, sometimes with themselves. Eyewitnesses are notoriously unreliable. In my work, I will often speak with multiple witnesses to an event and hear significantly different stories, even when the witnesses thought they had seen things the same way. These witnesses are often prone to suggestion, such as the "Isn't it possible . . . " questions that create avenues of doubt for grand jurors. Undoubtedly there was a huge mass of deeply conflicting testimony for these jurors to sort through. But, as McCulloch had to admit, Michael Brown died 153 feet from Darren Wilson's vehicle, dropped by a final shot to the head. Whatever the struggle at the vehicle, whatever criminal conduct Brown may have engaged in earlier in the day or when he encountered Wilson at the car, there seems to be little doubt that Darren Wilson shot and killed an unarmed man who had fled more than 50 yards from their initial confrontation and who did not pose an immediate threat to Wilson or anyone else. On its face, this was not a justifiable use of deadly force. As a lawyer, I would like to agree with McCulloch in the sense that I want to be able to say that the system has spoken, and that we need to accept that. In a fair and just world, prosecutors would not have agendas and would not guide grand juries to pre-determined outcomes and then point to the jurors' vote as evidence of the process's independence. But this is not the way things actually work. For many black people, given the reality of life in Ferguson, given the reality of race and class in this country, both historically and in the present, this surely would appear to be further evidence that the American legal system reflects the unjust, bigoted state of our society and provides little in the way of justice. Certainly it appears that way to me and many others, and that is the sad truth of the matter. The long history of bigotry and institutional racism in this country has been tempered over the years, but it remains with us, bubbling under the surface. In moments of crisis it erupts, a reminder of the anger, mistrust, and open wounds that remain unaddressed and unhealed. The Michael Brown shooting, the protests that followed, the militarized response to public anger, and the seemingly inevitable validation of the shooting of an unarmed man, are events that rip off whatever little scab was forming. This is a cycle we are bound to repeat and repeat again for the foreseeable future. Just don't pretend it's justice.